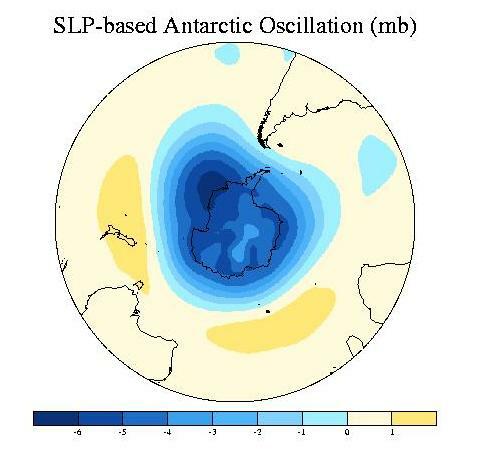 The Antarctic Oscillation (AAO) is the dominant pattern of non-seasonal tropospheric circulation variations south of 20S, and it is characterized by pressure anomalies of one sign centered in the Antarctic and anomalies of the opposite sign centered about 40-50S. The AAO is also referred to as the Southern Annular Mode (SAM). 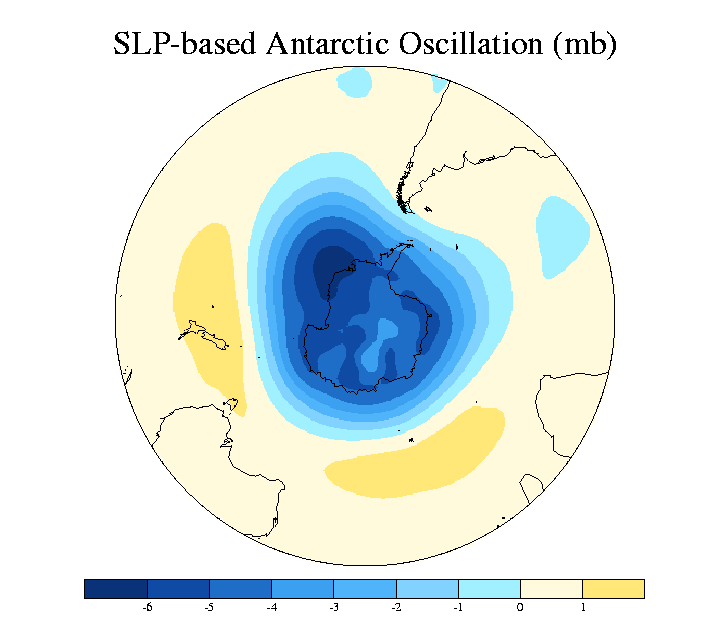 There is a Northern Hemisphere analog to the AAO, and it is called the Arctic Oscillation (or Northern Annular Mode). The AAO is defined as the leading principal component (PC) of 850 hPa geopotential height anomalies south of 20S (Thompson and Wallace 2000) and that index is available through this link. On this page I present an index which is calculated from sea-level pressure (SLP) anomalies south of 20S. This choice is the Southern Hemisphere counterpart of the Arctic Oscillation. The usefulness of the Antarctic analysis in the NCEP - NCAR reanalysis before the satellite era (pre-1979) has been questioned by Marshall (2002). For this reason, the pre-1979 values of the index are included for completeness, but should be used only after reading Marshall. 1) Anomalies are calculated for each calendar month with respect to the 1979-2010. 2) Each grid box is area weighted by the square root of the cosine of the central latitude. 3) The covariance matrix of the area-weighted data is calculated for the grid boxes south of 20S, and the principal component (PC, timeseries ) calculated for that matrix. 4) The PC is correlated with global SLP anomalies, and that correlation map projected onto the data, including area weighting, to produce a time series for SAM for the entire record. 5) The mean and standard deviation are adjusted to be 0 and 1, respectively, for the period 1979-2010, all calendar months combined. This is a standard way to perform this calculation. The AO exhibits large amplitudes in all calendar months and a pronounced upward trend. 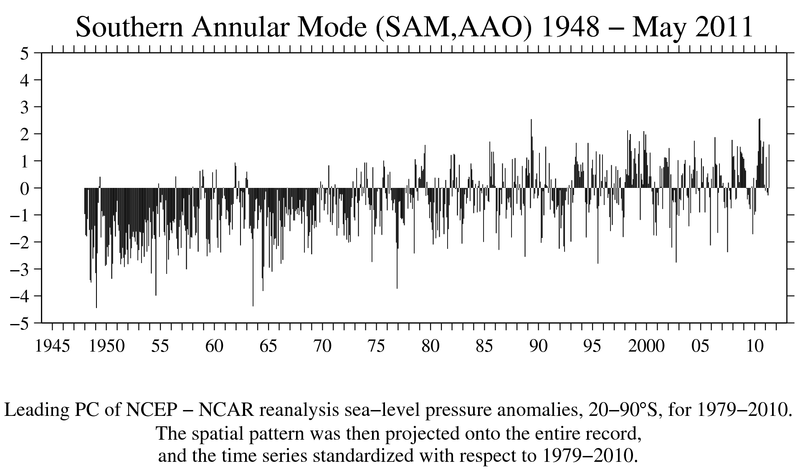 Regression of sea-level pressure anomalies onto the AAO (units of mb per standard deviation of the index). Anomalies of one sign centered over the pole (several millibars in amplitude), and weaker anomalies (mostly < 1 mb) centered at 40-50S. Netcdf files are provided of the digital values for the map-form analyses on this page (correlation, regression). SLP anomaly correlations with the AAO. 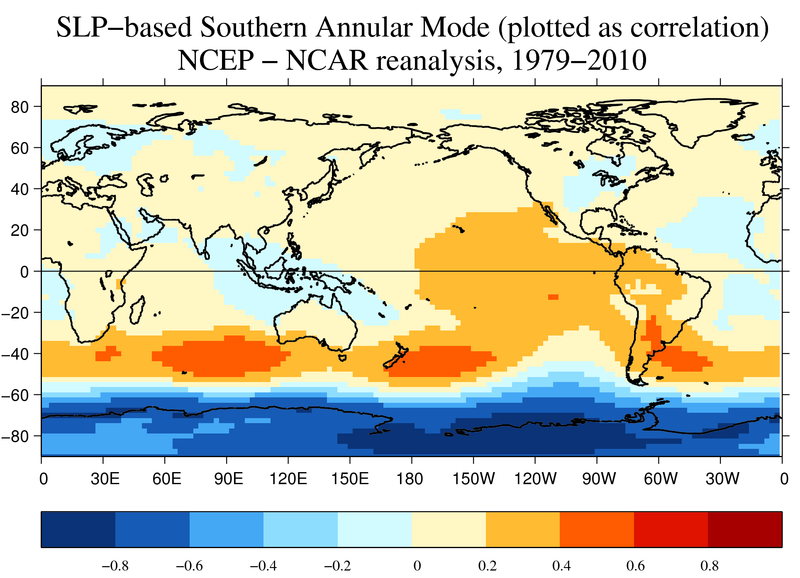 The AAO explains several percent of the variance in the tropics. Marshall, G.J., 2002: Trends in Antarctic geopotential height and temperature: A comparison between radiosonde and NCEP-NCAR reanalysis data. J. Climate, 15, 659-674. 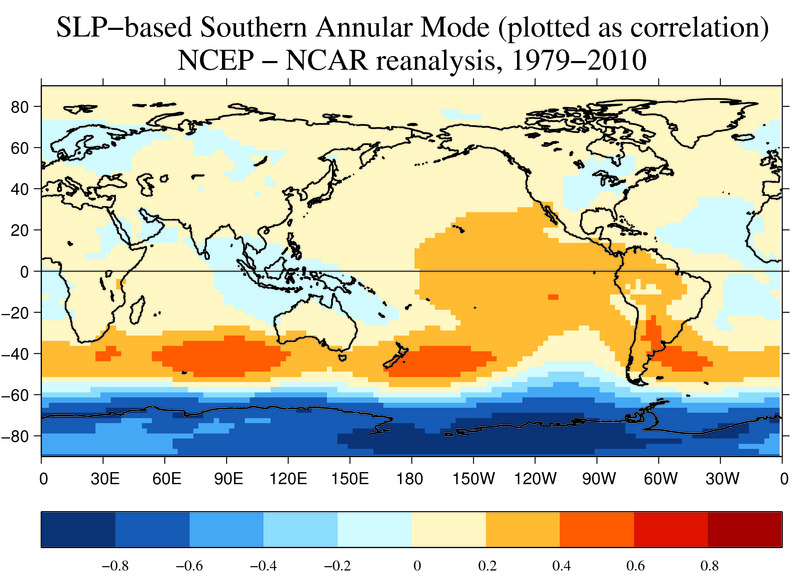 Thompson, D. W. J., and J. M. Wallace, 2000: Annular modes in the extratropical circulation. Part I: Month-to-month variability. J. Climate, 13, 1000-1016.